If you like the look of two tone gold, you will be enamored by this men's Italian 14K two-tone gold polished plain cross pendant from Apples of Gold Jewelry. The cross pendant by itself has measurements of 1" tall by 3/4" in width, and with the hoop/bale, the pendant overall measures 1 5/16" tall. The bale on the cross pendant measures 8mm by 3.35mm in size. 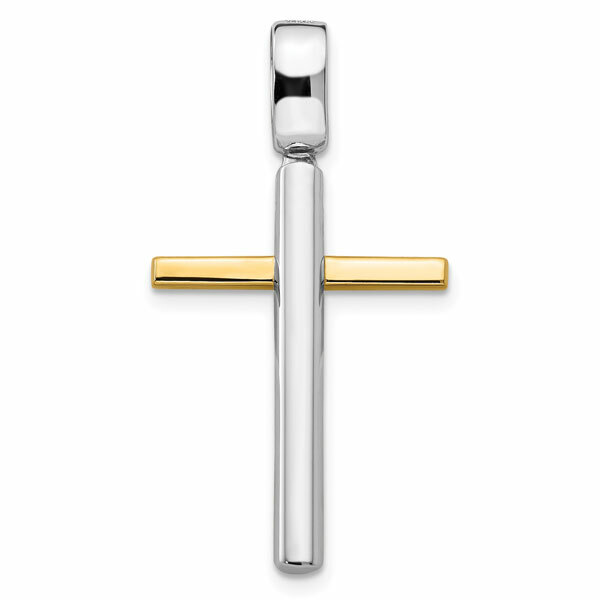 The vertical part of the cross, along with the hoop/bale, is made from 14K white gold, while the horizontal arms on the cross are made from 14K yellow gold on each side. The pendant is made in Italy. We guarantee our Men's Italian 14K Two-Tone Gold Polished Plain Cross Pendant to be high quality, authentic jewelry, as described above.